I had talked about DNA programming/computing previously (see my DNA computing and the end of natural evolution post) and today we have an example of another step along this journey. A new story in today’s Science News titled DNA used as rewriteable data storage in cells discusses another capability needed for computation, namely information storage. The new synthetic biology “logic” is able to record, erase and overwrite (DNA) data in an E. coli cell. DNA information storage like this brings us one step closer to a universal biologic Turing machine or computational engine. Apparently the new process uses enzymes to “flip” a small segment of DNA to read backwards and then with another set of enzymes, flip it back again. 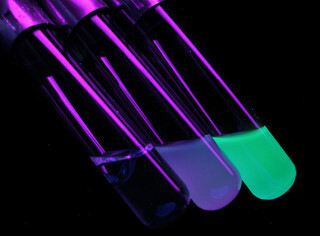 With another application of synthetic biology, they were able to have the cell fluoresce in different colors depending on whether the DNA segment was reversed or in its normal orientation. To top it all off, the DNA data storage device was inheritable. Scientists showed that the data device was still present in the 100th generation of the cell they originally modified. How’s that for persistent storage. State transition table or program = biological programming – Check (previous post plus today’s post, able to compute a new state from a given previous state and current data and write or rewrite data). As far as I can tell this means we could construct an equivalent to a universal turing machine with today’s synthetic biology. Which of course means we could perform just about any computation ever conceived within a single cell AND all generations of the cell would inherit this ability. Gosh the possibilities of this new synthetic biological turing machine are both frightening and astonishing. My original post talked about how adding ECC like functionality plus a ECC codeword to human DNA strand would spell the end of natural evolution for our species. I suppose the one comforting thought is that flipping DNA segments takes hours rather than nano-seconds which means biological computation will never displace electronic/optronic computation. But biological computation really doesn’t have to. All it has to do is repair DNA mutations over the course of days, weeks and/or years, before it has a chance to propagate in order to end natural evolution. Of course with such capabilities, “un-natural” or programmed evolution is quite possible but is it entirely desireable. With such capabilities we could readily change a cell’s DNA to whatever we desire it to be. My real problem is its inheritability. It’s one thing to muck with a persons genome, it’s another thing to muck with their children’s, children’s, children’s, … DNA. Let’s say you were able to change someone’s DNA to become a super-athelete, super-brain or super-beautiful/handsome person. (Moving from a single cell’s DNA to a whole person’s is a leap, but not outside the realm of possibility). Over time, any such changes would accumulate and could confer an seemingly un-assailable advantage to an individual’s gene line. There’s probably some time to think these things through and set up some sort of policies, guidelines, and/or regulations environment around the use of the technology before capabilities get out of hand. In my mind this goes well beyond genetically modified organisms (GMO) organisms that are just static changes to a gene line. Programming gene lines to repair DNA, alter DNA, or even to make better copies, seems to me to be an order of magnitude increase in new capabilities taking us to genetically programmed organisms that has the potential to end evolution itself. We need to have some serious discussions before it goes that far.